Collect diamonds to buy decorations for the new hospital wing! 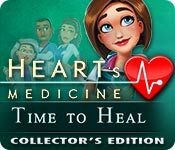 Heart's Medicine: Time to Heal Collector's Edition is rated 4.1 out of 5 by 39. Rated 5 out of 5 by itsmeetooo from My new favourite! I loved this game so much! My favourites have been the Delicious games...until now. I haven't liked the other Delicious knock-offs (Angela, Maggie, etc), but this one was great. It is challenging without being impossible; I liked the characters; loved the storyline, even though it was sad at some points. It also took me a while to get through, which I like. Highly recommend! Rated 5 out of 5 by circle00 from AMAZING story. Heartbreaking. Compelling. WONDERFUL. I want more games like this! Rated 5 out of 5 by Ruckus777 from Addicting and Fun! What a great game! I liked that it was framed like a dramatic comedy, with pretty funny dialogue and cool characters. The dramatic moments were played up by lovely music fit for television. The gameplay itself was lively and entertaining! I liked the challenges that made each level unique and challenging. Though at times it was a bit too easy, especially when you got characters to golden hearts, there were a lot of aspects that were still really fun. The character design was also pretty good, and the in-game sounds for patients felt realistic. I liked the minigames, such as tapping the syringe to get rid of bubbles and turning the IV dial for patients.I also liked the little guinea pig Oliver! Overall a really great and enjoyable game. Rated 5 out of 5 by jesa4 from Can't wait for the next one!! Love this game and everything about it! Can't wait for another one to come out! 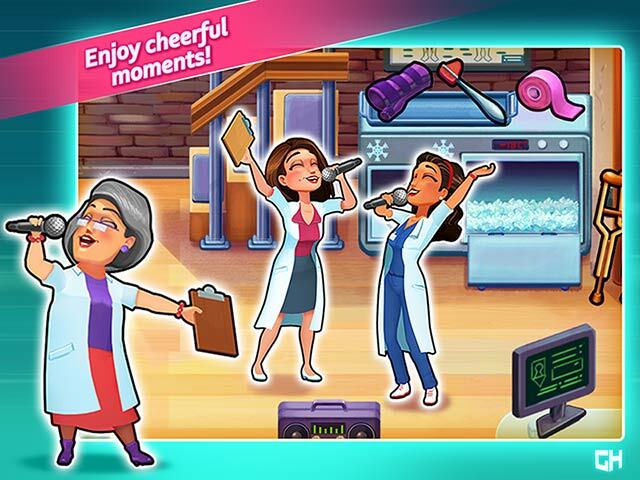 Rated 5 out of 5 by paktype from You'll Fall in Love with Allison and Everyone at the Hospital Perhaps the most engaging time management game I've ever played. The levels are fun and challenging and the storyline is funny, poignant and sad at the same time. The first TM game I have ever played where I was going to miss the characters when the game was over. Well done! Rated 5 out of 5 by POTATOMASHERJIM from The perfect time management game! Time to heal is a fantastic game. Its level of challenge is about perfect - you'll probably have to replay some levels to get expert score, but you won't have to pull your hair out over it. There was a lot of effort put into the story, making it an enjoyable game in that regard as well. This game was not too short (which Season One was). In addition, helping Emily out in the cafeteria was a fun addition for anyone who likes the Delicious Emily series. Rated 5 out of 5 by BarbMel from AMAZING but expensive I did the 1hr trial. But dying to know how the story will end. However, the game is very expensive in my opinion. Rated 5 out of 5 by Bardsley from Very impressed by this game, hope the series continues! 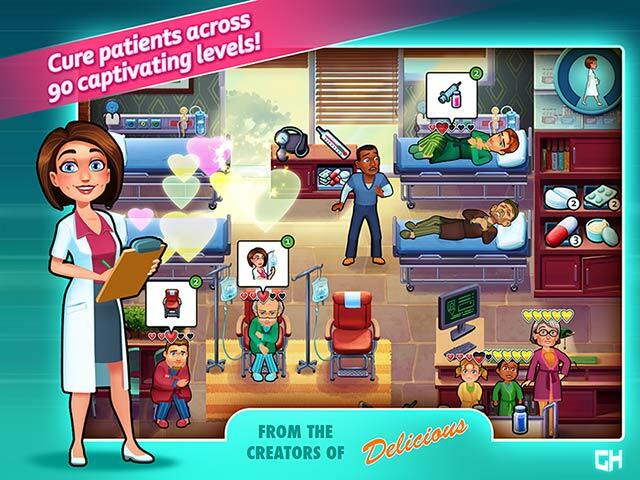 I've played all of the Delicious games and I was intrigued by this medicine series from the same developers. I'm glad I gave this a go. This game is visually appealing, has an interesting (though sometimes cheesy) storyline, likeable characters, and is overall more challenging than the Delicious games, but by no means impossible. I've finished the game with all achievements on Beginner difficulty without too much trouble. 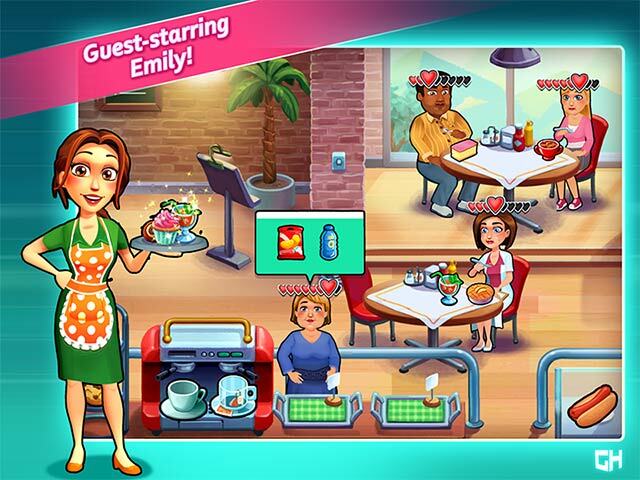 There are more mini-games than the Emily games and the different mechanics keeps the game distinct from the Emily ones. Some people have complained that this story is too "dark" but I disagree. It's set in a hospital, of course it's going to have more dramatic storyline. I like the more serious tone of the game at times, it makes the game more compelling and refreshingly different from the usually more light-hearted, family-oriented Delicious series. I really hope the developer continues this series, will definitely get the next game! Rated 5 out of 5 by lilsaphire9 from bigfish has done it again! this game is awesome great graphics great story line. I'm on level 53 right now it has 60 levels for me I cant stop playing I love this game. great job BF. Rated 5 out of 5 by PSSanDiego from Delicious Fans will love this challenging medical drama! Just finished, and I LOVED this game! I'm a long-time Delicious fan, and I consider myself pretty expert, but this game was pretty challenging (though doable, and not requiring so much mindless repetition of episodes to get all the trophies, as in some Emily games). The chapters in Dr. Heart's rotations in a hospital were interesting & different. Loved the characters, too. And the game play at the end was really cool (I won't spoil it, but it reminded me of medical computer games waaay back in the day...). As other reviewers have noted, the subject matter of the storyline is sometimes quite mature. But the game pulls it off, with a lovely original soundtrack to boot. FIVE STARS! Can't wait for the next one.